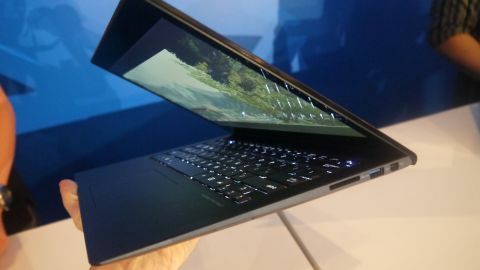 Asus made good at its promise to officially reveal the Zenbook Infinity (UX301 and UX302), its super thin but power-intensive touchscreen ultrabook, at Computex this week. Just several hours later, TechRadar and the Infinity were getting up close and personal, and while Asus is yet to confirm a few final specifics, we had more than enough time with it to form some initial impressions. If Tony Stark was an Asus guy then the Infinity is Iron Man's ultrabook. It's the world's first laptop to have a lid made from Corning Gorilla Glass 3, which might make it the most robust computer around right now. Think you can scratch it? Asus laughs in your face. As our demonstrator told us, the Native Damage Resistance means it should be able to withstand some decent sized drops. Obviously he wasn't too keen on the idea of us throwing the notebook around ourselves, so we'll have to wait until the full review to know for sure. But the exterior felt pretty steely when we took a coin and tried to scratch it. And the reassurance is welcome. At just 15.5mm at its thickest point - 14 per cent thinner than the previous generation Zenbooks - we could see this slipping out of clumsy hands. Speaking of which, we unfortunately found that the Infinity enjoys a good fingerprint or two. Luckily it isn't quite so magnetic to prints on the touchscreen display, but chances are you'll find that gorgeous exterior getting smudged a fair bit. We did wonder if the Infinity might be affording its slim design by going heavy on the weight, but our fears were put to rest the moment we picked it up. It's incredibly light even in one hand, feeling barely heavier than an iPad. The backlit keyboard and all-in-one trackpad are similar to other Zenbooks, and very reminiscent of the Macbook Air in both look and quality feel. Surrounding the keyboard and covering the trackpad is also Gorilla Glass 3 but with a matt finish. Turn it around and on either side of the notebook is a USB 3.0 port, while a Micro HDMI, Mini Display port and SD card slot are also squeezed into the side of the body. The display has a built-in touchscreen, which we found very responsive when jumping around the Windows 8 home screen and using the web browser. Our demonstrator was unable to confirm the exact resolution but it certainly looked sharp enough to be the 2,560 x 1,440 we'd heard it would be - matching Acer's new S7 refresh. The Infinity's slightness doesn't mean it's skimped on the specs. An Intel 28W Haswell dual-core Core i7 processor with Iris 5100 graphics power the way, which makes it the only fourth-gen ultrabook processor to use Iris. The Asus rep showed us a demonstration of the performance of Intel Iris in a purpose-built racing game, and there's no doubting that this tiny machine is ready for some serious gaming. Asus is yet to confirm RAM or storage sizes. Price and release date are also unknown at current, but we understand the Infinity is expected to land in Q3 of this year, and you'll have a choice of either Windows 8 or Windows 8.1 when it does. Fast, indestructible and almost painfully sleek, the Zenbook Infinity discreetly slips into the Haswell era with a lot going for it. It might be our favourite thing unveiled at this year's Computex, and while we're still waiting for Asus to firm some of the details, things could not look more promising. If this is the new standard for ultrabooks to aspire to, we've got nothing to complain about.